I know, I know school is just beginning so why the heck am I doing a post about graduation now? 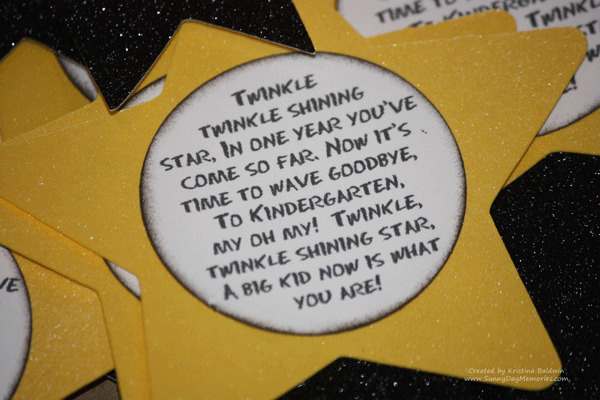 Well, truth be told, the summer just flew by before I could even stop and think about sharing all the great ideas we did at our Kindergarten Graduation Party last spring. But they were so darn cute that I couldn’t just let them fall to the wayside. First things first, due to school rules we couldn’t do traditional graduation with caps and such. So we needed to be creative in our approach to the celebration. 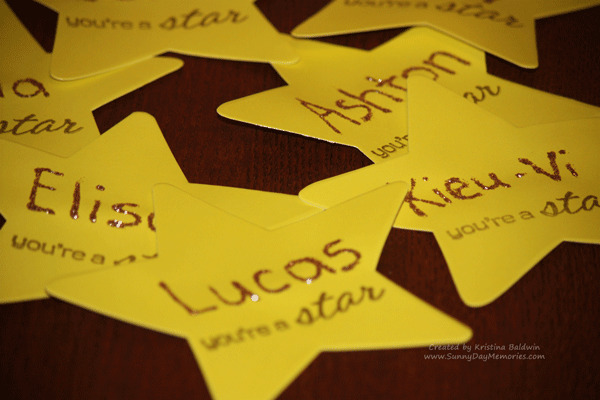 We came up with the idea to do a star theme. We started with how to decorate the classrooms. 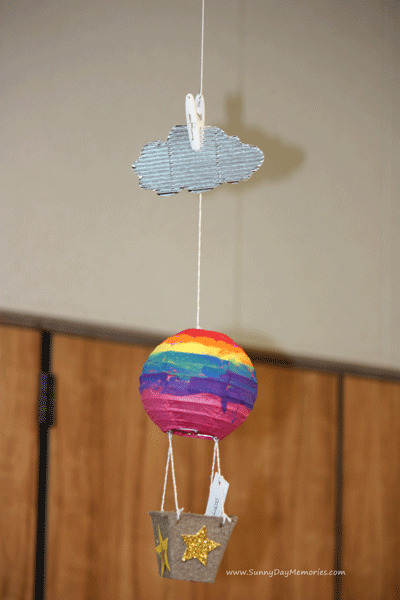 Each student created a large star by themselves to hang from the ceiling. Together, we made a classroom banner for the front of the room. 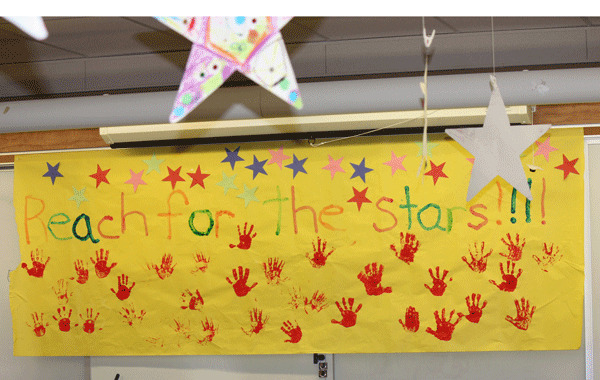 The kids added their handprints to the Kindergarten banner. After we had the decorations taken care of, it was time to think about some proper graduation hats since graduation caps were out of the question. 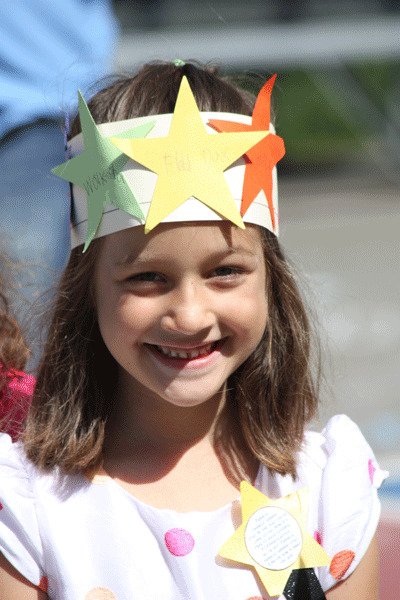 Again, the 2 classes started with the same basic concept–a star crown–but their end results differed. 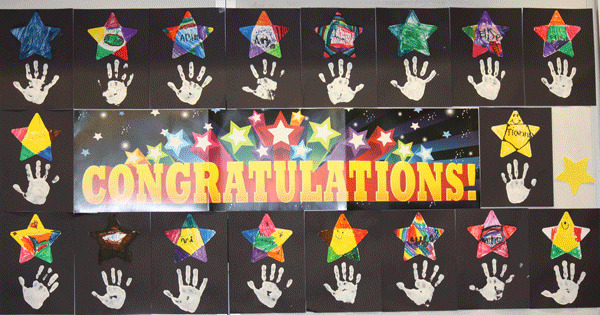 For my daughter’s class they took various colors of stars and had the kids write favorite things from the past year on each star–cute, right?!? 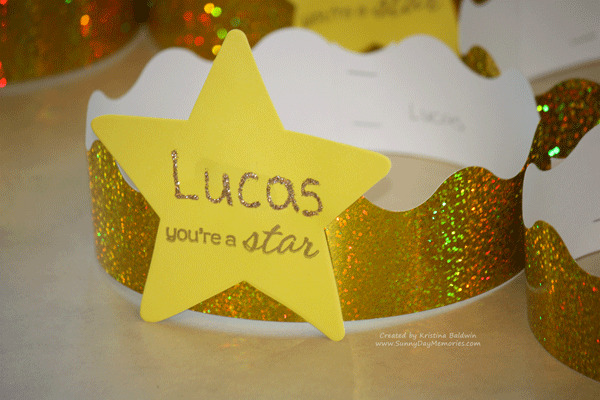 Since we took time creating the hot air balloons in my son’s class, I made up their crowns by stamping and writing their names in Glitz Glitter Gel. 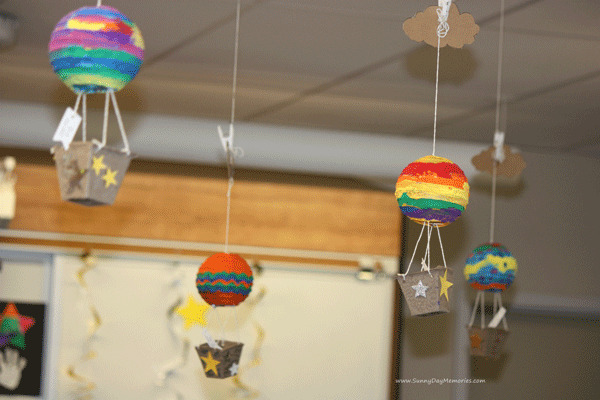 Next was the question of how to weigh down the balloons for the kids (of course the balloons had stars on them!!) 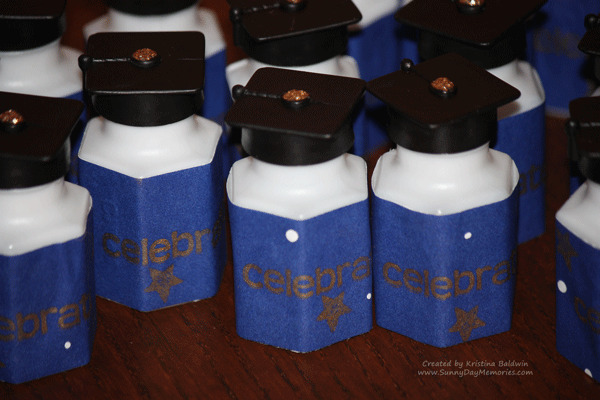 I had previously seen those mini bubble bottles for weddings at the dollar store so the teacher went to buy some. She bent a little on the “no graduation” theme by getting some graduation specific bubbles. I, of course, had to decorate the bottles! 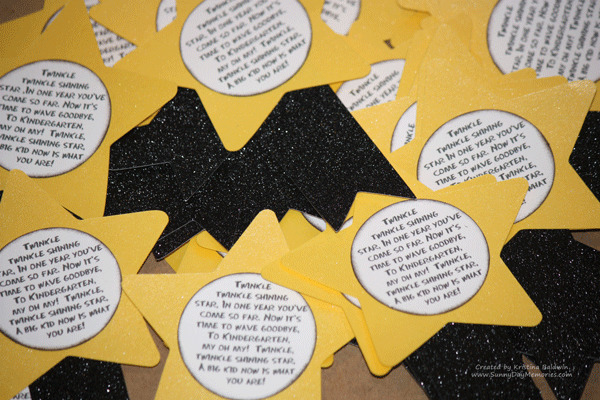 Then I affixed the strips to the bottles and added a drop of Glitz Glitter Gel to the caps and these kindergarten graduation gifts were ready to go! Using my Cricut Art Philosophy Collection made this SO easy. Otherwise, I can only imagine the hours I would have spent!! 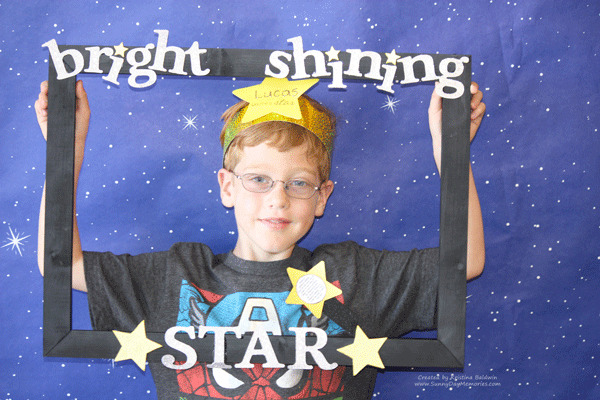 The celebration came together great with families bringing in themed foods to pull the theme all together–cheese cut as stars, star sandwiches, star sugar cookies and Rice Krispies Treats, star fruits, etc. 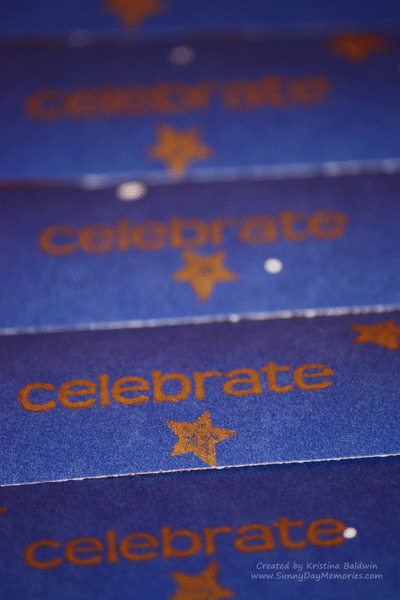 A very fun and memorable celebration for sure! This entry was posted in CTMH Cricut Projects and tagged Cricut Art Philosophy, DIY Party Ideas, DIY Projects. Bookmark the permalink.